Once you have joined the Ladder you can't leave it or join another one until the Ladder has closed. 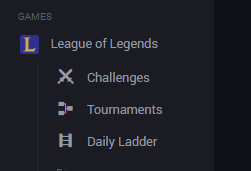 You can see how much time is left on the Ladder Overview. To get a position in the Ladder, enter the League of Legends 5v5 Solo/Duo Queue with the same Summoner and play the first game. You can play as many games as you like during the length of the Ladder, but only the 3 best games will determine your total score. 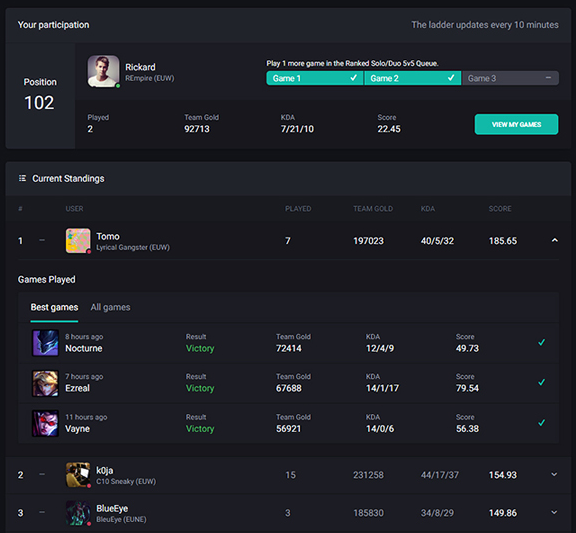 In other words, if you have played 6 games during the day, the 3 games with the highest score will count towards the total number of points you get and your final placement in the Daily Ladder. You need to verify your Summoner (to show that you are the owner of the League of Legends account) before you can play. Once you've played a few games, your position and status will update automatically to reflect your current score. The current scoring is described in the bottom right of the Daily Ladder view. In short, winning games and getting kills, assists and gold will give you points. The scoring may change as we improve and update the Ladder. Learn more about the scoring method here. Please note, you need a ranked Level 30 Summoner to join the Ladder.